Not all rums are created equal. Each brand has a different flavor profile that is ideal for a different style of drink. 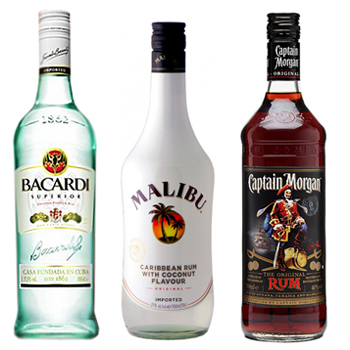 For the best experience, send your friends this rum set that will let them experience a wide array of flavors. Your recipient will receive a crisp bottle of Bacardi Superior (700 ml), a bottle of rich Captain Morgan Black Label (700 ml), and a bottle of flavorful Malibu Liquor (750 ml). Celebrate graduation, add to a weekend retreat, or make sure your favorite host has a stocked bar with A Night Of The Tropics Rum-lover set. "My son, Lewis and his beautiful bride, Zulema, received the basket just before their wedding ceremony. They were thrilled with it Smile. As they had chosen an intimate occasion with just the two of them - on the other side of the planet - this gesture meant so much to me and my husband. I would certainly recommend your services - especially to the discerning customer, as your reassurance and ease of ordering, coupled with the great follow-up service, gives peace of mind Smile. Thank you, again."